There is a place I would love to see a photo of. 'Our' church was St Mary's Bramall Lane but for a time (war damage?) services were held in a small building which I can't place, but have an impression of a bus or tram garage nearby. Failing a photo, can anyone identify the location? 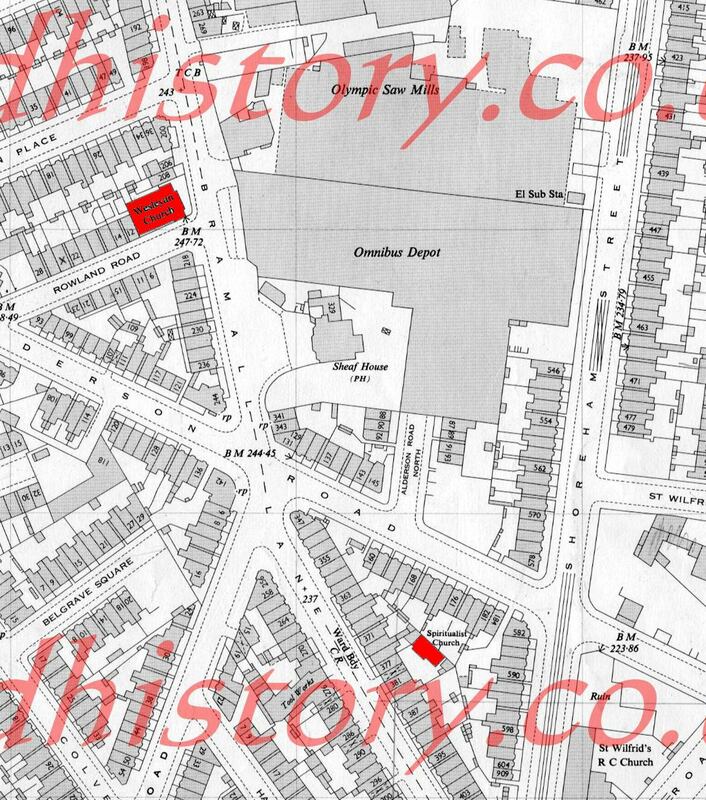 Depot on Bramall Lane, (on map) next to Sheaf House PH maybe? Leadmill Road Depot, (not on map) ? and we can then start looking for photos. First that comes to mind is 'Leadmill Mission Hall' seen on the L/H side. Leadmill bus/tram Depot is on the R/H side of this photo .. I thought I had a good idea, why not look to see if St Mary's has a website. Well it does, but in the history it says (paraphrased) due to bomb damage the church was moved to ? So even they don't know! I've looked at the map but nothing stands out. I can picture the location in my mind, but it's not easy to describe. As we approached the church, walking down a straight road there were two roads running off it, one at near right angles, imagine west, and the other would be WNW. The building was very small, and in my mind it was little more than a hut. I can see the surrounding buildings all grime blackened as so many were at that time. at this moment I don't know my left from the right ..
A Red wine burp from a fat balding bloke is not quite as bad as a garlic chicken burp from a kitten/cat. Leadmill Mission Hall sounded like a good bet, but I'm not sure. It looks bigger than I remember in the pics on Picture Sheffield. I was only about 7 or 8 though. If I could see the building showing the main door it might help. I think these buildings may have had some connection to the church. As at a later date a community/scout hall was built on the site. I think we need the help of member 'plain talker' on this one. At the end of Bramall Lane, left hand side, about 100 yds before Queens Road junction, there was a "hut" in the yard of some terrace houses. It was there in '69-70. We rented it as storage for the second hand shop on Asline Road, but it was a church building of some sort before that (we were told). That would put it right as far as being very close to a bus garage. I also asked a friend who used to be the Verger at St Mary's. He says there's a historian involved with the church. He's going to ask him. Also the friend suggested that it may have been the Baden Powell Pavilion which is/was? in the church grounds. That would be great if contact could be made with the historian. Isn't this the most infuriating thing about trying to dredge up memories. If only I had asked my mum when she was still with us. Too late now. The small church near the bus depot sounds interesting. Still waiting for them to contact me. These are the two buildings I mentioned marked in red. Not exactly as I remembered them but more or less right. The small church I thought was on Alderson Rd / Bramall Lane /Asline Road junction, is actually a bit further up. The "hut" we used as a storage warehouse was apparantly a Spiritualist church in the 50's according to the map. As you can see, they're both close to the bus garage. Looking at old pics of Leadmill Rd, I think it could be the right location. I seem to remember the tramlines. If it is the right road then the building was just a little further down the road that Leadmill Rd led off from. I am trying to get info from my brother but I am not hopeful. Someone asked about a building where services were held when St Mary's was damaged during the war. A few possibles were suggested but nothing definite. I said I'd ask someone I know. He's just found out for me, but now I can't find the original question. 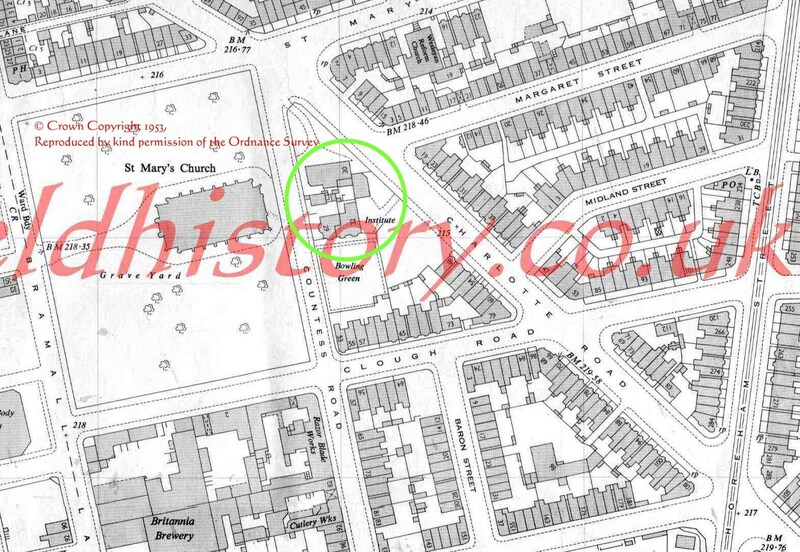 Anyway, according to his sources (he was the Verger) the temporary location was on Leadmill Street. If anyone remembers where the original post is, could you move this somehow please. or was it Mortimer Street Chapel? I did read the name somewhere but can't recall where! Vox, thanks so much, it was my question. 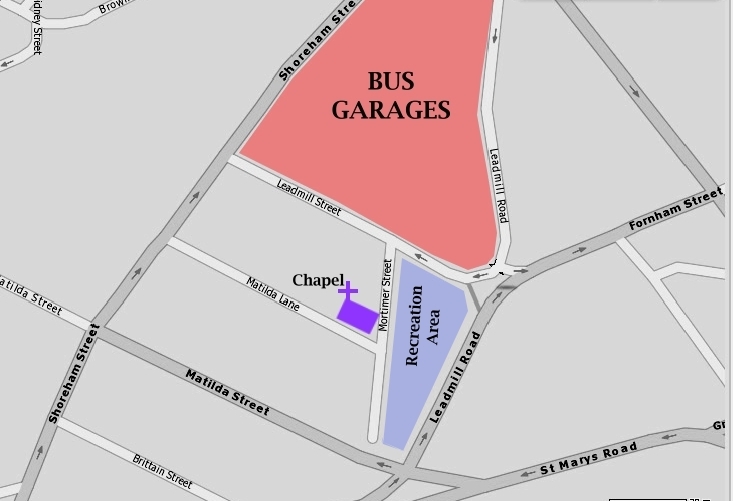 The buildings circled in green on the map, in SteveHB's post (post#8) are currently called "the pavilion", and are part of St Mary's current Church-And-Community Centre's complex of buildings. The building that stands there currently, is not that old though, to my knowledge. I remember the section of Countess Road that runs between the church and the pavilion being closed, in order to make a "Play Street". Apologies that this is not a more comprehensive answer. Further to my last post here's an email from him. It was in March 1957 that St. Maryâ€™s Bramall Lane was re-dedicated after being converted into a â€˜dual purposeâ€™ church. This long suffering parish had lost in the â€˜blitzâ€™ the use of the church and the vicar had taken his flock to join the welcoming congregation of St. Barnabus. In May 1943 they moved again to their own mission church in Leadmill Road which had also been badly damaged, but had been temporarily repaired and which was used for services until the re-dedication. I hope that answers your friendâ€™s question. Vox - thank you very much, that makes it absolutely clear where it was.